For customers who open only one of their French doors, or sliding glass door half way. Keep your French doors open for natural cooling. Bug Off costs hundreds less than other French door screens, with more available sizes and custom sizes too. The easy, do-it-yourself installation will not damage your French doors. Great for parties and BBQs! • For customers who open only one of their French doors or sliding glass door half way. • Keep your French doors open for natural cooling. Bug Off costs hundreds less than other French door screens, with more available sizes and custom sizes too. The easy, do-it-yourself installation will not damage your French doors. Door Size (WxH) in. Choose an option60"R x 80"64"R x 80"72"R x 80"72"R x 96"
By customer demand, we have taken our patented design and created a side opening Bug Off Reversible French Door Screen for customers who only open one of their French doors, or their sliding glass doors halfway (that’s most of us). Our French door screen works on French doors that open in or out. It spans the width of both doors, but opens in the center of one door only. Instead of a center opening 50/50 split, is has a side opening 25/75 split. It can be turned around, or reversed depending upon which side you want to open. And with our Reversible French Door Screen, you can open one, or both doors and easily go in and out. We make 4 standard sizes and we make custom sizes for customers with custom French doors, or custom sliding glass doors. The Reversible Bug Off Screen is also a perfect screen for sliding glass doors, since most people open their sliders about half way. If you only need temporary protection for one of your doors, you can install one of our smaller 30”, 32” or 36” screens between the jamb and one closed door. But you will have to take the screen down to close the doors. We recommend this to our customers who do not frequently open their French doors, but would like to have temporary protection for party or barbecue, for instance. The screen can be taken down and re-installed in minutes and can be stored away in small spaces when not in use. This is a less expensive solution for those who do not need permanent insect protection. Our reversible design allows you to close both doors without removing the screen. If you always open both doors, we recommend our standard, center opening design. Please see our standard screen diagram. The Bug Off Reversible French Door Screen has all the same convenient features as our center opening design. 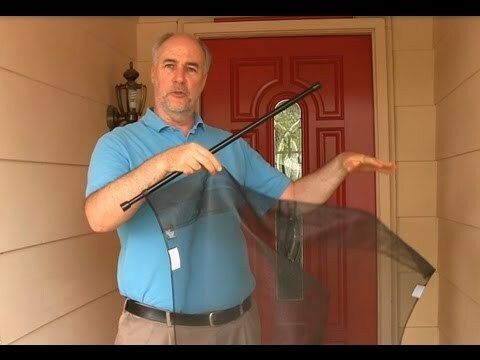 It provides a simple tool-free installation that won’t damage your door frame. The Reversible French door screen is portable, so you can move it from door to door and store it away at season’s end. It’s available in custom sizes for your custom doors. And it provides magnetic, hands-free entry and exit for you, your family, guests and pets. Our call center can take your order, but cannot answer all of your questions. Please EMAIL your questions instead of calling, or email your phone number and we’ll call you back. All screens are shipped FedEx Ground, or Priority Mail. Shipping & Handling is $9.95 for the first screen and $7.95 for each additional screen on your order. All USA single screen orders of the 30″, 32″, 36″ x 80″, 34″ x 79″ and 36″ x 84″ ship Priority Mail. All other sizes and multiple screen orders ship FedEx Ground unless shipping Priority Mail to a PO Box. Please allow 5-7 business days for standard screens and 10-15 business days for custom screens. NOTE: OVERNIGHT & 2ND DAY DELIVERY ARE UNAVAILABLE. APO addresses, Puerto Rico, Virgin Islands, Alaska, Hawaii and international shipping, including Canada. 1. After placing your order Bug Off Will follow-up with an email to you that includes your shipping charge and final total. From that email you will be able to click a convenient link to pay for your order. 2. We ship Priority Mail with delivery confirmation for APO addresses, Puerto Rico, Virgin Islands, Alaska and Hawaii. For addresses outside the USA, we ship Global Express Mail (5-7 days). For more information you can email us through our contact page. If for any reason you are dissatisfied simply return Bug Off Screen within 30 days for a refund on product and California sales tax, excluding shipping and handling. There is no need to call us for returns, replacements, or exchanges. Return to Bug Off Screen 2501 Newport Ave., Cambria, CA 93428.